I realize this might not look like much. It probably looks suspiciously like a salad, which means it’s probably going to be the last kid picked for your holiday cooking olympics. It doesn’t taste like ginger, linzer or crushed candy canes. It smacks of January Food, the stuff of resolutions and repentance, and there’s no time for that now. But I need to tell you about it anyway, urgently, because the preoccupation with this salad has hit me so intensely, so wholly, it’s basically the only thing I want to eat, and since I’m ostensibly the grownup here, this is exactly what I’m going to do. I had this for the first time two weekends ago, when I got to spring a surprise Miami Beach getaway on my husband as a belated birthday present. We had dinner the first night at José Andrés’ Bazaar, the kind of prolonged, indulgent meal that, I’m sure purely coincidentally, usually only occurs when we’re not simultaneously parenting. I don’t think we had a bite of food that was less than pristine. I’ve been a little obsessed with Andrés’ cooking since I lived in DC, right around the time Jaleo opened. I remember piling in there one night in 1999 with friends in town from New York and one told us that he really wanted to study in Paris the next year, but he needed someone to stay in his rent-controlled East Village apartment and also take care of his cat while he was gone. My roommate and I have never volunteered ourselves so quickly, not that anyone asked me my “welcome to new york” story. Even without such life-changing memories, the food was perfect, and no matter how many pork and scallop products were on the menu, there were always vegetables too, treated as carefully and respectfully as the finest jamón serrano. Our Miami meal was no different, which is why I guess it shouldn’t be a surprise that of everything we ate, it was this seemingly random composition of goat cheese, almonds, oranges, chives, sea salt, endive, sherry vinegar and olive oil that I haven’t stopped pining over since. My mother and I had this for lunch on Friday. I had more with dinner. I managed to eke another plate in on Sunday night and I can tell you with unwavering certainty that I will be eating this alongside my latkes on Tuesday. It’s at once a salad, appetizer and also finger food for parties, because, well, if you think I ate those little endive boats with a knife and fork, you might be mistaking me for someone with better breeding. Besides, how better to taste the happy commingling of fragrant citrus, tangy cheese, crunch of deeply toasted almonds, droplets of intense sherry vinegar and fruity olive oil, all finished with sea salt than to grab it by the endive boat and sail off with it? 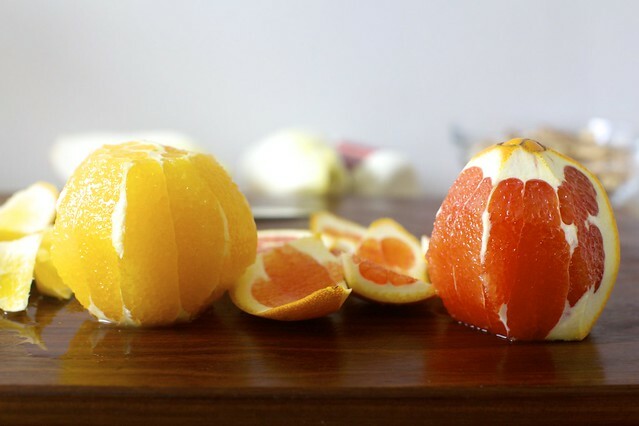 Cut the top and bottom off your oranges, exposing the citrus flesh inside. Then, resting on either end, cut the peels, including the white pith, off the oranges. [Set aside for orangettes!] 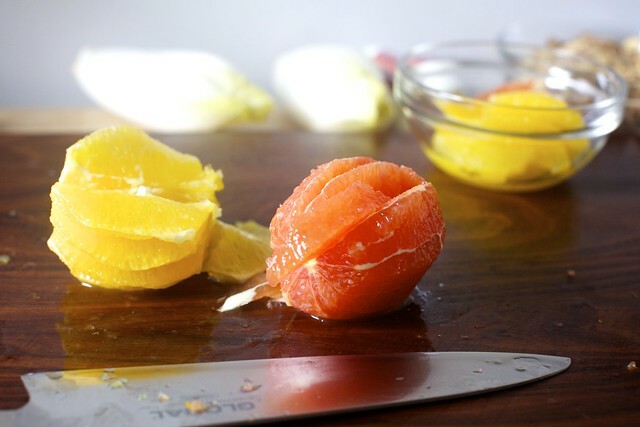 Use your knife to cut between each membrane and orange segment, cutting only so far as the center, which should release the orange segments. You can chop them once or twice more, so the pieces are not too large. Trim end off endives and arrange individual leaves on a medium platter. Add a few orange chunks to each, then goat cheese crumbles and almonds. Season with black pepper, then drizzle with a very thin stream of olive oil. Add a few droplets of sherry vinegar to each “boat.” Scatter chives over and finish each with sea salt. Dig in. No forks needed, unless you’re classy. I like that this is “January food” and not the usual candy or carb-y recipe I’ve been seeing lately. Thank you, how refreshing! There simply cannot be too much citrus right now, and toasted almonds? Never a bad thing. Yum….looks like a nice complement to all the bacon-wrapped, mozzarella stuffed christmas-y appetizers on our holiday menu! I keep thinking persimmon when I look at this. Trying to decide if I could swap out the orange for persimmon and blue cheese for the goat cheese. I can’t quite put my finger on if it would work, or if I should just leave these flavors to escarole and be done with it. Great welcome to New York story. Crazy that that was 15 (!) years ago. wow, these are going to be part of my starter for Christmas dinner, if I can get some endives here in the Uk. yum!!! Do you think this would work with pears subbed for the oranges? I had these at a happy hour at Jaleo two years ago and also haven’t forgotten their magic. Thank you for sharing this recipe! With all the cookies and baked goods I’ve been eating and baking over the last few weeks, this would be a welcome addition to my diet. This looks absolutely delicious! Doesn’t look like much? It looks fantastic! If I see one more crockpot of meatballs or cheese dip, or one more plate of over-sugary treats, I am going to scream. So this, my dear, is the perfect antidote. Thank you. carinissimo finger food, perfetto per la tavola di Natale! So delicious looking! Must try these! Ah these look summery and lovely! Come for Christmas in Australia if you are looking for balanced feasting. While our tables are decorated with the traditional trimmings, summer means lots of fresh fruit and vegetables. This reminds me of the salads that go with plates of cold seafood and cured ham. 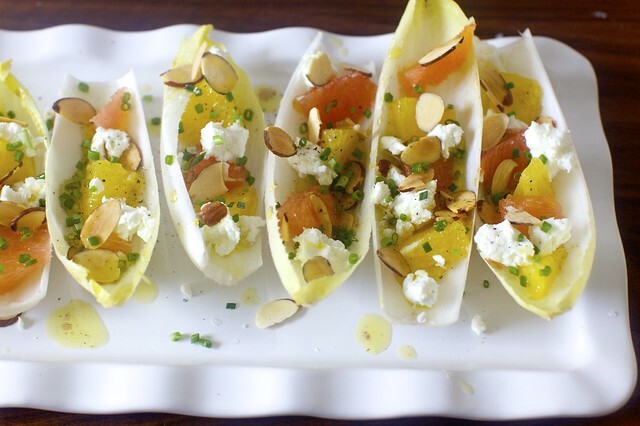 I have to try your delicious take on endives! My house is crawling with oranges right now! Actually I would rather make this than anything else right now. The flavors sound amazing together and I can imagine the light crunchy texture is addicting to. I can’t wait to try them! Very light, healthy and easy to make snack! Though I’m not too fond of endives – to bitter my taste usually – I read this with so much pleasure. Not enough. I read it out loud to my husband because I couldn’t stop grinning and giggling. Thanks so much!! Oh, I will forward the recipe to my mother in law, she definitely will love it! You had me at goat cheese ! These look really lovely .. something I may serve on New Year’s Day. OMG, I remember having these at Jaleo in DC too. They are every bit as delicious as you say. I think the dressing back then was just chive-infused olive oil. So good. This combination is one of my favourite childhood salads: shredded endive with oranges. These days I can’t get enough of red endive with blue cheese. Mmh. As per #20, CM, I find endives to be so bitter! I could eat the rest of the ingredients right off the endives, using the endive leaves like a plate, but eat the endives themselves? Raw? Maybe, maybe cooked to death, but raw? Which only goes to show you how bitter is viewed differently by different people, I guess. I can’t do bitter or spicy and everyone, these days, likes one, the other or both. I saw the picture and thought, wow, that reminds me of a delicious appetizer I had years ago at Jaleo. Turns out I was almost right! Yum! I’m trying to cut back on all the baked treats this holiday so this could be a nice replacement. This is one of my favorite appetizers at Jaleo! I highly recommend using garlic infused olive oil for the drizzle — it makes it even more delicious! Deb, I was so excited when I read the name of this post! We just moved to the DC area and have been frequenters at the “Jaleo Hour” which has this on the menu. It’s delicious and I’m excited to try making it! This looks so stupidly easy, but absolutely amazing. What a perfect bite. I’m making this next week when the kids are home! I tossed together something very similar as a salad to go with my Thanksgiving feast. I couldn’t stomach the thought of chopping yet more vegetables to make a boring garden salad, and I had oranges (for zest) as a component of my cranberry sauce, so I grabbed a bag of mixed greens, some cracked-pepper goat cheese and almonds and went for it. I used balsamic rather than sherry vinegar, and my presentation was more three-year-old than Michelin Three Star, but it was a hit! That is some lovely supremed citrus! I have yet to master that technique, but this is a darn good reason to try. What a perfect canapé! I wish I’d seen this before my holiday party! I used to make something very similar to this (only without chives and with a little drizzle of honey), although I haven’t thought about it in a long, long time. Now that I am thinking about it, I’m pretty sure I the inspiration came from something I ate years ago at Jaleo. Thanks for reminding me. What a fresh and vibrant treat for the holidays! You had me at goat cheese. If you had said “diced steamed boot” next I still would’ve gone for it. YUM! I’ve been trying to figure out what light and refreshing but not, you know, crazily austere thing I can make for lunches this week. This looks perfect. Thanks! This looks lovely, and I agree with others, so nice to have something more healthy to balance out all the rich foods around (afraid guilty myself), but that is such gorgeous colors and flavors. So often the simple things are the best! There was a salad at a now-defunct restaurant I used to love (in Oakland, CA) that featured endive, orange, hazelnuts and smoked trout… yum. I’m not a fan of goat cheese, but I’m thinking that some feta might fit well in this. Do you think so? I love oranges on salads, rather than those off season tomatoes, in winter. And, I love this take on the orange and almond salad. Way back when, there was a chain restaurant called The Magic Pan. They had this orange, onion and almond salad they served with their main course crepe entrees. I’d went there just to get the salad ( I didn’t really prepare food back then!) I can’t wait to try this! To be truly guilt-free, replace the goat cheese with home-made Labneh cheese made from 0% fat Fage Greek Yoghurt — easy to make, no one will know the difference, and … ZERO PERCENT FAT….!!!! Take 500 grams of the plain yoghurt, put in cheesecloth-lined strainer over a bowl in the refrigerator, and let it drain the whey for 3 days; discard liquid. Then you can use the cheese immediately for a recipe like this, or spread on baguette, or you can finish by making walnut-size balls and roll them in finely chopped mint and parsley, carefully fill a small jar with the balls of cheese and top with olive oil to preserve. Thanks Deb for the great recipe to use the Labneh in! Oh SORRY forgot major step — mix a half teaspoon of salt into the yoghurt before draining for 3 days. You read my mind! On the way home from work I kept thinking how I wish I had something to crave beside the heavy cheesy rich foods of winter! This is it! This is crave-worthy! This is exactly the appetizer I need for tomorrow night. Deb, you are the best. Thanks. Those look like an absolutely delightful appetizer! The little boats are so cute! I’ve actually never had endive before, but I’m pretty sure that I need to remedy that lack fairly soon! This looks delicious!! And LOVED hearing you on Leonard Lopate today!!! So neat! I love the look of this and I think that if one can sneak in a plate of January food here and there in December, well, then January can be less January-like. That’s my logic. This is gorgeous! exactly what I want to eat right now. Refreshingly light – great with champagne! This sounds like the perfect holiday appetizer! Cut off the very bottom of the endive, and push it into a bowl of kosher salt. Leave it overnight- the salt draws out ALL of the bitterness. Nice! But I say feta instead of chèvre. Yum! We’re having our annual White Christmas party Friday and this will balance all those little meaty appetizers perfectly. Thanks for a really fresh and easy idea! I’ve actually never made anything with endive, so looking forward to something new. These remind me of my mother- she would love this dish! Beautiful and tasty! Thank you for sharing! I’ve made this same salad but with tart apples instead of citrus, and no chives. It’s been years sine I’ve made it, but I think I might have to revisit it this week! Jeni – you can get endive in the UK, but for some reason we call it chicory over here. Waitrose sell both white and red varieties. I love endive, and these super cool boats surely look awesome! Perfect! I needed a healthy, but special side for a Potluck Thursday night. This will definitely fit the bill. Thanks! Look great and perfect as a nibble that the kids might not devour. How about some pomegranate seeds on there, for colour, as I’ve never seen cara cara oranges here. I guess clementine would also work (though maybe too sweet?) or pink grapefruit? I could see this with a little avocado. Love avocado and citrus salads! I find the juxtaposition of this post with the previous jelly doughnuts (particularly the pictures) thoroughly amusing, and delicious! That looks so good! So clean and fresh! I’ve made a version of this with a Cooking Light recipe. It’s always a hit. The version I like uses candied walnuts for a sweet crunch and also mandarin orange slices, which are just dang easy. I’ve made these for quite a while now. I take the goat cheese and mix it with a little bit of orange juice to smooth it out. I then pipe it into the endive and cover with oranges and almonds. It’s always a hit. Can’t wait to try it. Question: with such great flavor contrasts, what wine would you serve with it? Suggestions? Pretty sure it’s “eke” and heads of endive, FYI. That sounds heavenly, and I think it’s a great idea to have something a little lighter to offset all the heavy, carb-y Christmas food (not that I have any objection to heavy carb-y food, believe me!). I wonder if a sprinkling of pomegranate seeds would also work, and make it automatically Christmass-y for the doubters? This is such a beautiful (and healthy) appetizer!! Love it!! This will be on my Christmas Day menu…thinking that it might be interesting to make a spread of the goat cheese, a little cream cheese, the juice and zest of an orange and the toasted almonds. The oranges could be thinly sliced in rounds and placed in the endive boats. The spread could be piped or spooned onto the oranges and then drizzled with the sherry vinegar and a few drops of deliciously rich evoo. We love endives and eat a lot for Christmas, with blue cheese, raisins and pine nuts, delicious too! Of course we’re classy! But even Emily Post (if I recall correctly) was all in favor of eating finger food with the fingers. She included asparagus in this category. Maureen — Actually, you just reminded me that there was some orange zest over my whole dish at the restaurant, so it’s definitely welcome there. I think the oranges might be too big to fit in the endives if they’re cut in circles, but maybe I’m not picturing it well. I also prefer them without the membranes… Regardless, it will be delicious and everyone will love the brief respite from cake and cookies. Hester — Pomegranates would be very pretty here, which reminds me of this salad I did a lot of years ago. The proscuitto overwhelmed a bit, and was distracting (I’d probably crisp a few pieces and crumble it, if making it again) but the pomegranate against the greens were gorgeous and festive. Travels4Food — Thanks, now fixed. Ooh, you posted this at just the right time for me! I am thinking of ideas for finger foods and easy to eat foods for a buffet-style dinner party I’m having, and this would be perfect instead of a salad. This sounds like a great combination of ingredients, and even though it’s not January yet, I think we might all need a little bit of healthy food – this holiday season is going to make me turn into a cupcake soon. sounds delicious and light! will bring this to Chanukah party at my mom for a healthy refreshing change- though i do crave deep fried holiday foods..:) loved your talk on the leonard lopate show! I made some tonight….they are yummy! I haven’t used endive much before; they seem fairly sturdy. Do you think I could load them with the oranges and cheese a few hours (4 or 5) before serving, and then add the almonds, oil, etc. right before? Oh Deb! Is your door always knocking with hungry friends waiting on the other side? I bet you have to fight them off with a stick! This recipe is perfect for people like me who live in the caribbean where even winter is hot! Really fresh and tasty! loved it! Thanks! Growing up, endive for me was pretty much an unknown, pronounced “enn’dive” by my mother when she rarely used it in the 1960s. But as a newlywed in the 1970s, we moved to France then Switzerland where “ahn-deeve”, as the Europeans pronounce it, is pretty much a staple. I learned a million ways to serve it. Our go to for endive then was to saute it til browned, sliced lengthwise, then smother it in parmesan cheese. Chopped in salad was easy and tasty too. Our 39th wedding anniversary is this week and for old times sake, I’m going to make your endive hors d’oeuvre. Thanks for the walk down memory lane! Substitutions — If you don’t want to use endives, I don’t see why another lettuce would work, maybe small romaine leaves or, my other favorite, some leaves from a small head of Boston or Bibb lettuce, which are very “cuppy.” Other fruits can be used, pears and persimmons have been suggested in earlier comments. P.S. — These citrus salads are clearly a theme for me, although I forget every year that there are others. From early this year, there’s a Fennel and Blood Orange Salad with hazelnuts, mint, lemon juice and paper-thin shallot slices, which we love very much. And from 2010, there’s a Mixed Citrus Salad with Feta and Mint, plus a teensy bit of red onion and red wine vinegar. I mention these because if you’re not into endives or almonds or another ingredient, there are a lot of other ways to make citrus salads. Leah — I cut my finger in the process! I say this so you’re not too impressed. :) I don’t cut myself often, but I was chatting away with my mother and I’ve been wearing a Muppet band-aid since. Which is to say, I guess it all worked out in the end. OK….I made these and they hit the spot! Just the antidote to all the sugar and fat we’ve been consuming. I used what I had which was 1 oranges & 1 grapefruit, feta cheese, and drizzled on a balsamic glaze. Delish! This looks delicious!! Will definitely be trying them over the holidays. Made these for my book club tonight–a hit. So simple but so much flavor! Thanks. Wow! This looks absolutely delish! I think I will be trying this on my Christmas table. My parents are coming and they will absolutely love this too! Took this to a party last night and everyone loved it! Fun to prepare on the spot with some help from other guests. I substituted balsamic for sherry vinegar because that is what I had and it was still yummy. I make another endive appetizer that nestles a little cream cheese, smoked trout, and tart red jam or jelly (red currant or cranberry) in an endive leaf- delicious. These will go very nicely with my latkes and rib roast. Something light alongside the heavier flavors. I hope my son, the professional chef, will be suitably impressed. this is the perfect thing to fill out our christmas dinner menu, which involves brisket (heavy) and cheddar mashed potatoes (rich). 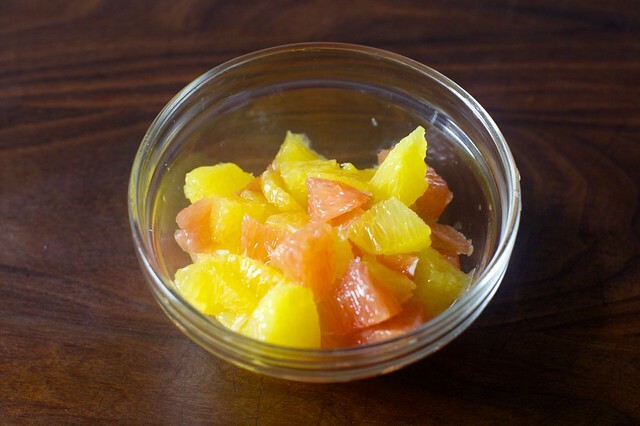 a bright zing of citrus is just the ticket – thank you! I made these for 2 holiday parties. I LOVED them, but at the end of the night, there was always something left on the plate. I’m not sure they are appreciated by the masses. I was impressed how long they stood up (hours) and still tasted good. Made this for a party yesterday. It was a big hit. I added pomegranite seeds as I could only find one colour of oranges in the markets. This was gorgeous. My husband ate it with slices of prochuitto (spell?). He loved it that way. I was worried about the very dark almond slices but it worked well. Oh Deb, I had 4 heads of endive in the fridge and have made this two days in a row, also for our Chanukah party. THANK YOU! I love this. These were a big hit tonight at a Seahawks party – I have never seen a group of burly men so enamored with a salad appetizer! Nice and light and flavorful. What a beautiful and refreshing appetizer option! I had these last weekend at a family party. I could have eaten the platter full. I am now making some for my family – question – i have some awesome blueberry balsamic vinegar. Is that too much for this recipe? I made this over spinach last night (with feta!) and it was phenomenal. Made these for holiday party on Saturday night in Washington DC. Guests devoured them- yes a tray of 50 plus endive boats- gone in moments! Seems no one at my party has had them at jaleo- so I gave you all the credit- as usual. Thanks for providing a much improved endive app recipe! Endives are all the rage this winter between you and Naturally Ella. They make such cute little crispy boats. I made these as an appetizer for my Christmas Eve dinner and they were a big hit! Everyone loved having something a little lighter and even the doubters (“what ARE those?”) ended up being fans. Thanks and Happy New Year! Why is the world so confusing! Regardless of what they’re called, these look delish. Planning to serve these for New Year’s Eve. Have a coconut infused white balsamic vinegar that I plan to use. One guest is dairy free, so I will leave the goat cheese off some of them. Any ideas of additions to the dairy free version? Thanks for the recipe. These were amazing – I got wind of this recipe before New Year’s Even and did a test run. Here were my additions – though not necessary as it was delish as is. Used Umami Salt instead of sea salt to give it an earthiness… Also used Walnut oil instead of EVOO. Such a nice refreshing change to the regular appetizers out there at this time. Love it. Made these for a second time with the addition of pomegranate seeds- even more delicious than the first batch! I have made these 3 times since Christmas and am making them again tonight for New Year’s dinner. They are fabulous. Don’t change a thing in the recipe! The bitterness and crunchiness of the endive, the sweetness of the oranges and the tang of the goat cheese are what make it so special. I made these for our New Year’s Eve dinner-so wonderful! Thanks! I made these for a dinner party and they were well-received. I have to go sulfite-free so substituted rice wine vinegar for the sherry vinegar, which I think worked well. I will say, those orange segments are kind of a finicky business… it’s a lot of work for what amounts to not much orange, and I felt like I was throwing away at least half the fruit. Makes me wonder if there would be an easier method, or perhaps an easier fruit? I made this tonight but as I couldn’t find any fresh chives, substituted fresh mint instead. So fresh and delicious! I’d never used endives before and loved them. Thanks, Deb! i made these for New Year’s Eve and they were delicious! Thank you and Happy New Year! This looks so yummy — but I cannot do goat cheese!!! What can I use in its place? Edith — Just use another cheese you like, I like feta and ricotta salata for crumbly/salty, or maybe blue. 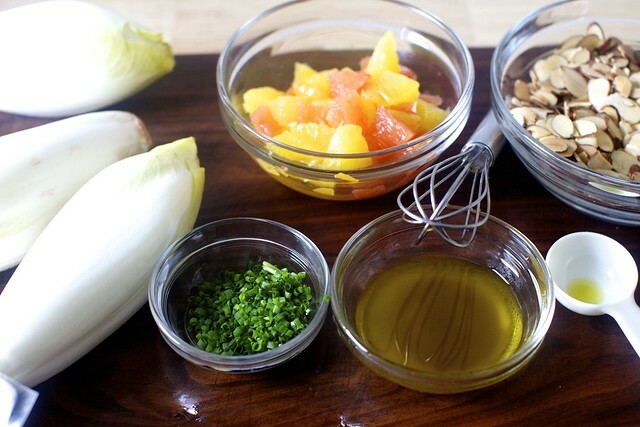 This endive orange salad sounds so good and so refreshing. Definitely one to add to my list of recipes to try. I love the combination of endives and oranges. Having made this twice in the last week, I also believe the recipe is perfect, or nearly perfect, as is. I’ve never been a fan of endive or goat cheese but somehow combined in this way the endive lost some of its bitter edge and the goat cheese wasn’t as harsh. What remained was a bite that was texturally dynamic, subtle but still full of flavor. Yum!! I LOVE these!! I worked for an Andres spinoff in Annapolis for a while and ate these all the time for my staff meal. I also yanked his gazpacho recipe from that recipe if you’re ever hankering for it… it’s my best recipe for the stuff and I eat it all summer long. nom. Apparently endive is hard to find in whichever Canadian locales I’ve been searching (Toronto and Vancouver). Needless to say, this is perhaps my new favourite party-dish especially at Christmas when everything else is sugar and fat overload. I made them as an appy on Christmas day, again on the 27th when friends stopped by, and a 3rd time on NYE with another set of friends. I love the tart/fresh taste and that it’s a veggie finger-food without it being crudites and dip. I will continue to make this for all occasions until citrus disappears and it is spring. Oh, also I’ve always used 2 oranges: 1 ruby grapefruit which is my favourite way because I far prefer grapefruit, although not everyone else does. Turned all ingredients into a chopped salad (and replaced the almonds with hazelnuts because that’s what I had) – yummy!!! The DH and I made this exactly as recipe describes (except I used very little salt). It was FANTASTIC! Wow! So festive looking and fresh-tasting, a great winter salad/appetizer. Made it for a vegetarian potluck and we were very popular. I made these tonight for my pre-Super Bowl party and they were delicious and a big hit! Thanks Deb! I’m WAY, way behind the game on this post, but it somehow slipped by me and now I am catching up. I actually had this (almost) exact dish at a tapas restaurant in Omaha (!) in 2006 or 2007. The fact that I remember it so vividly tells you how delicious it was. The only difference in the version I had at that time was that they used Marcona almonds (which I can see making this salad even more buttery and scrumptious). Just a thought for in case you ever want to make a slight variation/tweak to your existing version. Thanks for the recipe – I’ll definitely be making it! Rachel — Yes, thanks for the reminder. Definitely used marconas at the restaurant, but I couldn’t find them the day I was making this. Ok, so I’ve now made this three times in the past couple weeks, and have received a request for it for Christmas. So refreshing and good. Love your recipes, Deb. I’ve made about 5 in the last month and EVERY STINKING ONE IS SO GOOD. Thank you for sharing them with all of us. There aren’t too many recipes I’ll make for guests without testing them first, but yours have been, without fail, excellent, so yours I will! Made this for Christmas Eve…outstanding! A bit of time to assemble, but worth it. I hate doing the oranges but have made this many times anyway, because it’s so dramatic to look at and to eat, especially midst all the heavy holiday fare. Pomegranate seeds looked good but we didn’t like the seed texture or the bitterness. Because we’re not fans of goat cheese I’ve done it with Gruyere, Gina Maria cream cheese, Blue , and Gorgonzola.All were okay, but Gorgonzola was far and away the best. I ran across some sliced, honeyed roasted almonds at Trader Joe’s and they were really dynamite, especially on the ones I made with pink grapefruit and CaraCara oranges. Thanks for making me look like a good cook again, Deb. I’ll be serving this to guests who really ARE good cooks this weekend. I made this recipe as part of an appetizer spread for my housewarming party. I loved it! Several of my guests really liked it, too. The male guests were suspicious of how healthy it looked haha. This is a great salad! I have made it several times with a combination of blood and naval oranges and it’s so pretty and tasty. I have made it in endive boats as written. Beautiful presentation and convenient when serving an array of appetizers/finger food. It is somewhat difficult, however, to serve in that manner if you multiply the recipe to serve a larger crowd. Those boats take up a lot of platter space. My solution was to cut the endive into pieces and serve it as a composed salad. For Easter, I made it with butter lettuce instead of endive. I think it’s the first time that a large salad has been entirely consumed at one of our holiday meals where the competition between yummy selections is stiff. It’s always a hit. Thanks, Deb! Yummy! Just made this for a little Friday afternoon appetizer. 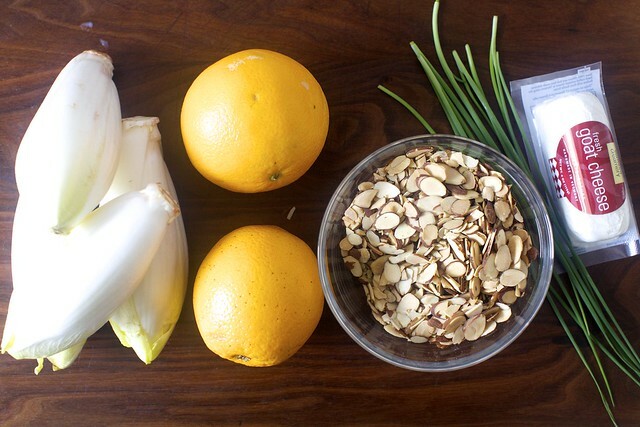 Drinks and Endive with almonds and oranges = a great start to the weekend. How many useable leaves should there be in an average “head of endive”? This is a very good question and I’m sorry I never checked. I’d say a 10 to 12, plus some much smaller. Heads will vary greatly; I tend to look for smaller, more tightly packed ones because I like the flavor, so that’s where the 10 to 12 guess comes from. I could only find what seemed like smaller endives, so I bought three but still had leftover filling. None of my endives had many decent sized leaves and I could have actually used four, as I think the filling easily makes 20-24 pieces. I guess I bought *tiny* endives! Does sherry vinegar taste at all like red wine vinegar, or does it have a completely different taste all of its own? I find it has a deeper, milder flavor but both vary wildly in quality/taste between brands. If using red wine vinegar, start with less. If you have balsamic, I think it’s a better swap. Made this for a tapas themed birthday party. So easy and delicious! Also, made of fruit and vegetables, so it’s healthy and refreshing. Definitely a keeper! yummy. I often combine endives (which we call chicory I think) with pomegranate and put a dressing made from olive or lin-seed oil, lemon juice and some sweetener like honey or agave syrup on it. I think this would also be a nice twist on this recipe, but I will first try your version without any of my tweaks (I’m quite bad with recipes but should have learned to respect them by now :)). Thanks for all your lovely ideas. How far ahead of time do you think this can be made? I’m thinking of making this for NYE appetizers and would like to put at least part of it together earlier in the day. I made a test batch last night for my book group guinea pigs. Well-received, delicious and beautiful! I am frantically re-planning my Christmas Party menu for my soiree tomorrow night as the rain is pouring here in Orange County and I’m dreading the freeway and the 3 different markets and 2 different delis and cheese shops I have to lug my toddler to… and every single one of us ladies is sweating in barre to work of the champagne and pavlova calories… and this came up in my search and you never fail me! It’s perfect. The colors are gorgeous, it’s refreshing, and will go well with my smoked trout and salmon heavy appetizers (I’m doing heavy appetizers and finger foods.) Cheers ! I saw this recipe when it was originally posted and made a mental note, but it took me until today to actually make it as late lunch/snack, and it was SO GOOD. I made it exactly as is, except I used rice wine vinegar instead (didn’t have sherry), and I didn’t toast the almond slices because I was too hungry. Loved it – it was so refreshing, and so satisfying, yet nice and light. A fantastic bright spot on a cold, slushy winter day. This will be a go to recipe forever – thanks! Also, I’m currently making your everyday meatball recipe for dinner – it smells delicious in my apartment right now! Just made this tonight for Christmas dinner appetizers and it was a hit! No changes from me at all! I had never felt the need to spend $10+ on vinegar, but a Deb take on a Jose Andres dish? Sold. Swapped feta for the goat cheese, forgot the chives, and went with oranges and pomelo for the citrus. Amazing. And the sherry vinegar makes the other ingredients sing! I am looking forward to trying this! I have already tried a different but similar thing with pear instead of citrus and walnuts instead of almonds. It was absolutely delicious and I’m sure this will be, too. Really delicious! It hits all notes, can taste each ingredient cleanly, while leaving your palate open. An appetizer that speaks to me. I admittedly made one substitution due to my husband’s nut allergy – used toasted pine nuts in lieu of almonds. Thank you for sharing. It’s wonderfully light and bright for a seasonally winter dish. I made this with my mom on a whim. It was incredible. Then we made it for a Russian party. Now she makes it for every Russian party because that is what is demanded of her. I ate TEN of these for dinner last night. Fantastic! I had some Belgian Endive and so did a search. Anticipating tonight’s dinner (at 8:30 am) already. This looks amazing, but I am planing to add some pomegranate arils and caviar to it for NYE! BIG HIT! I hosted a family party, and everyone raved how amazing it was. All 8 people loved it. I used white truffle olive oil instead of regular, and it took it to another level. Thank you for posting!